“We’ve been overshadowed in recent months by other things, and we’ve got to get our strategic plan out there,” said Lynn Kelly, president of the city-funded Coney Island Development Corporation. The agency plans to step up its fundraising efforts soon for expensive projects like the restoration of the B & B Carousel, boardwalk and streetscapes. 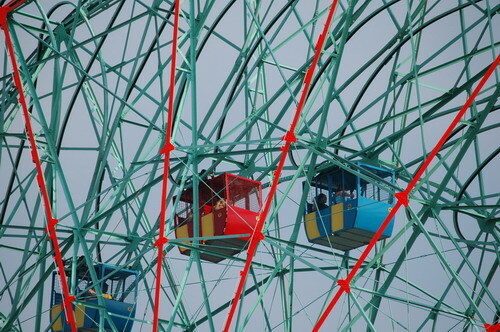 Kelly and other board members have in the past expressed concern that any apprehension about Coney Island’s future could hinder those efforts and keep visitors away during the transitional period. The board unanimously voted to approve up to a $10,000 monthly retainer fee, for up to two years, for a marketing consultant who Kelly said could counteract that effect. The money would be paid out of the agency’s $150,000 annual consultant budget. That person would “still work in tandem with the city’s press office,” said Kelly, of the city Economic Development Corporation’s press staff. Contrary to some perceptions that business in Coney is down, there is some sense that things are actually busier this year. There was apparently record attendance at the Mermaid Parade (it wasn't just our imagination). Diana Carlin, AKA Lola Staar, told the Eagle that "so many people are coming because they think it’s going to be the last year...Business has just been incredible [this season]." There is a bright side to every dark cloud. Is Blogging Therapy or Journalism (Revisited)?